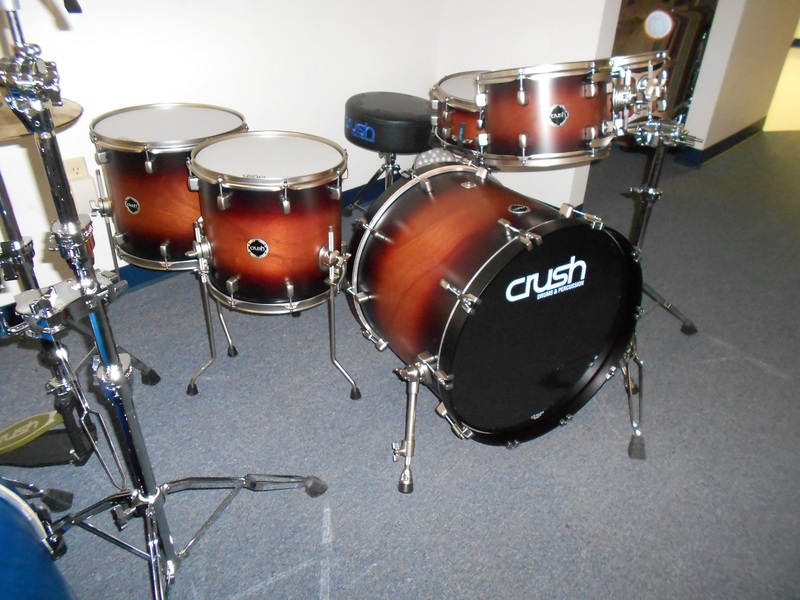 Last year, I had the opportunity to check out and review a Crush Sublime kit for DRUM! Magazine. I was really surprised at how drums were constructed, and how well-designed all the shell and hardware appointments were on a product from such a young company. Since then, I’ve been keeping an eye Crush’s growth, and it’s been great to see how fast they’ve come up. So, I was really excited when I received an invitation to tour their facilities and be among the first people to see some of their new product for 2013 before the Winter NAMM show. It was a long drive down south, but it was well worth the trip. Check it. 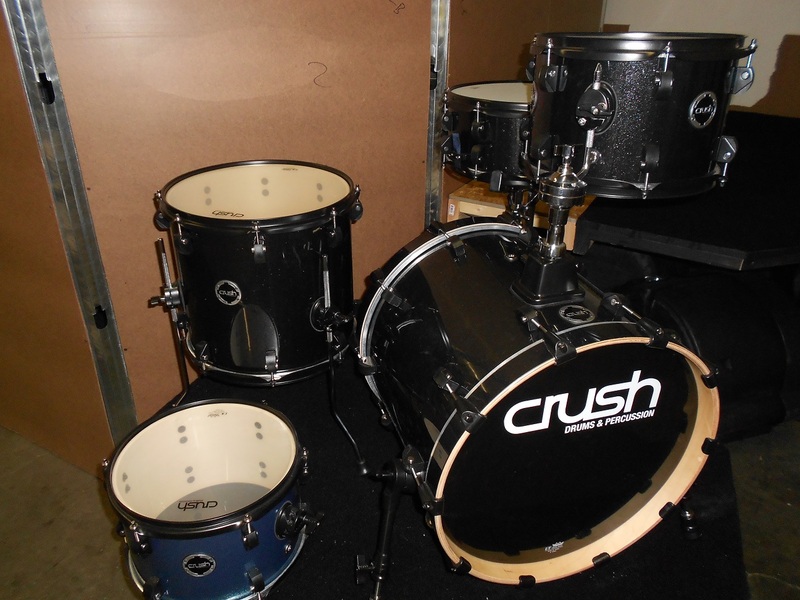 Even for Florida, the weather was unseasonably warm on the mid-December morning I visited the Crush Drums and Percussion headquarters in Tampa. “Coping” with the balmy seventy-degree temperatures in shorts and t-shirts, the Crush team welcomed me to their unmarked, non-descript home base and immediately took me on a quick tour. This incredible Mahogany Reserve Kit is there to greet visitors to the Crush compound. The building is their third office in as many years – a clear indicator of how quickly the young company is growing – and one look around offered a ton of insight into the attitude and approach that’s helped them become so successful. Guests will also get a look at this awesome Sublime E3 kit. Peep those colors. First, there were drums everywhere. Seriously. Every inch of otherwise unoccupied floor and wall space was filled with display kits, prototypes, one-offs(including the KILLER 20×16” Tour series kick seen in the photo above) and even a few unfinished exotic shells that might have been the first sign of a new venture for the Crush Team. It was like drum nerd heaven. The next thing I noticed was all the toys and trinkets. Action figures, statues, video games, LPs, a dope framed Radiohead poster and other personal effects were packed onto every flat surface too small for a drum. That may seem like a curious detail to include in a write-up about a drum company headquarters tour, but to me, it just made the building feel more welcoming. Based on how hard these guys are working, it’s obvious that the Crush office is really a second home for every member of the team, and it’s clear that they’ve gone out of their way to make it feel as comfortable as possible. The last part of the front office that really took me by surprise was the recording studio run by Crush CEO Terry Platt’s brother. Tucked into the back corner of the building’s workspace was a modestly sized room with dim lighting and no windows. This room was very different from the rest of the building. Jam packed with speakers, studio equipment, and of course, toys, the room was like the audiophiles equivalent to Kevin Smith’s command center from the fourth Die Hard movie (I promise that’s a compliment). It was rad (sorry for the lack of photos here, Terry’s brother looked very busy so I didn’t want to disturb him with a bunch of flashing snaps). The studio operates as a mostly separate entity from Crush, but having an affordable in-house recording operation obviously helps bring a little extra attention to the Crush brand. Savvy. 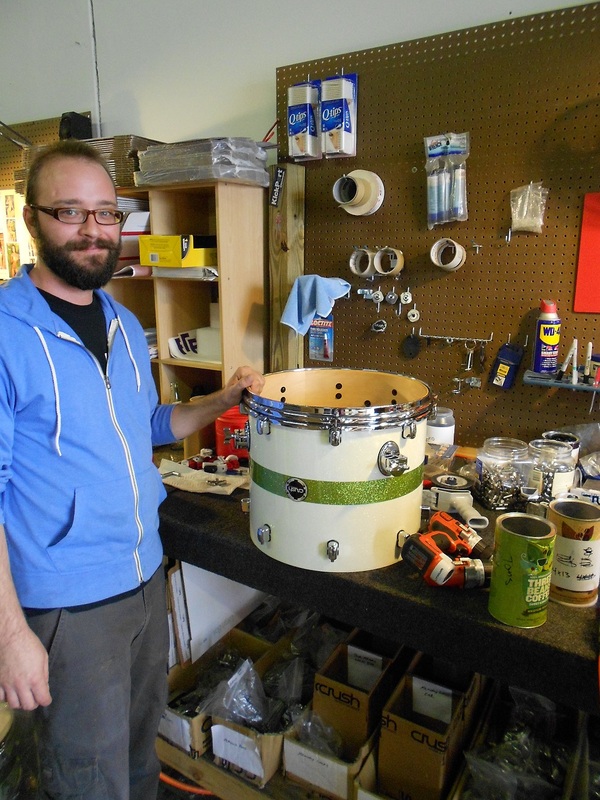 We listened to a few projects recorded with Crush gear (all of the drum tracks were done in the office or warehouse space – no giant wood rooms here) and they sounded excellent. The whole thing increased the family vibe and added another element to the business. Solid. After the office tour concluded, we moved out to the attached warehouse space. Please excuse the horrible picture above, but even with the fuzzy quality, there’s no denying, that’s a lot of drums, bro. Every single drum gets the Crush QC exam. 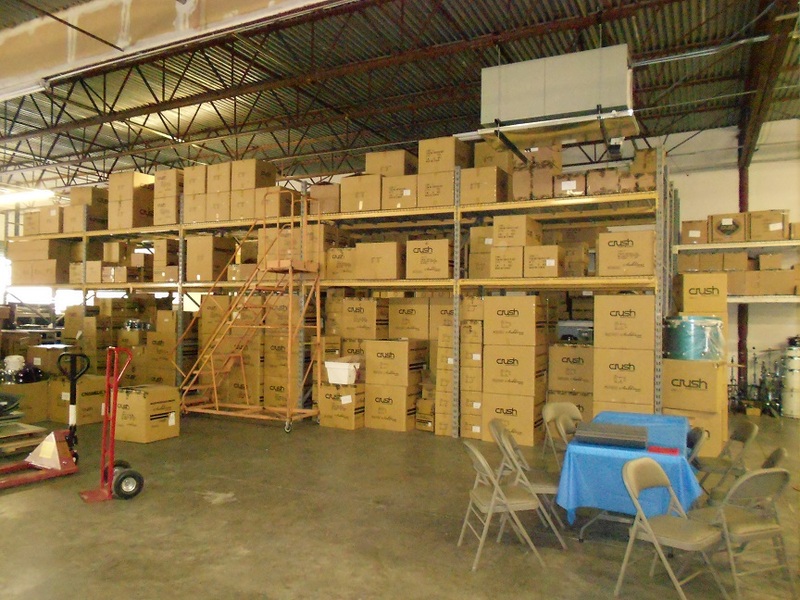 The warehouse (which was only half full on the day I was there), serves not only as the storage and shipping hub for all of Crush’s US distributed product, but as the quality control center as well. Because all Crush drums are made in a separate facility, EVERY SINGLE drum is un-boxed and de-headed, and then checked for loose or defective screws, bearing edge cut, interior and exterior finish cleanliness, and shell defects. Each and every drum. In fact, the company’s commitment to quality is so high that Platt mentioned returning entire shipments (70+ kits) of product to the factory if things weren’t up to snuff. Now, consider the fact that a return that large isn’t a free exchange for them. Shipping something like that costs a great deal of money and time, so each time Crush finds a flaw, they’re electing to take a BIG risk in order to get you the product you deserve. Hats off. This handmade hoop-truer also serves as a great display for some of Crush’s selection of finishes. In addition to shelf after shelf of drums awaiting shipment (as well as an archery range and one of Platt’s huge model planes), the warehouse was also the temporary home of Crush’s 2013 NAMM show booth. 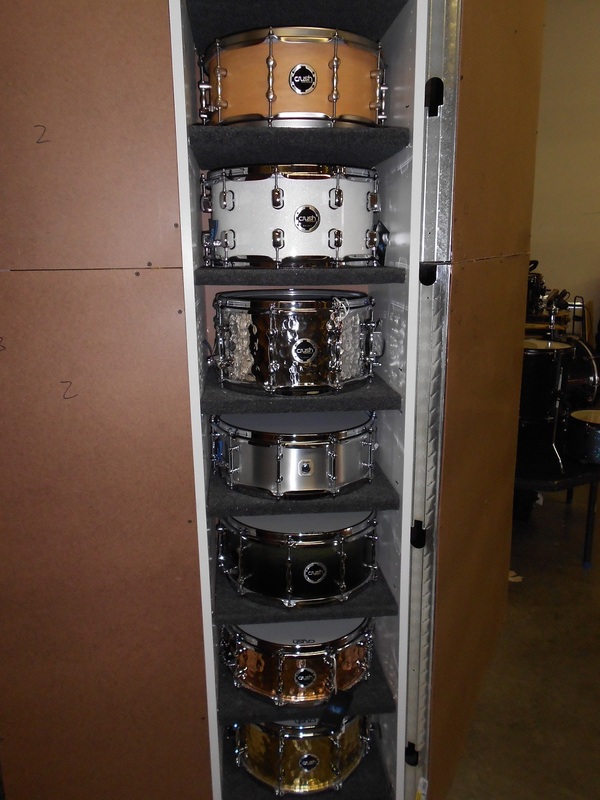 The monster set-up featured two built-in shelving units to display a selection of their new and current snare drums, a centered platform for their show-stopper kit (nuts – stay tuned), and flanked risers supporting a few new additions to their drum set lines. Here are a few of the standouts. First up, this small acrylic shell pack offers a scaled back, affordable option for those who love the look, but need something a little smaller. With an 18” kick and 10 and 13” toms, the kit looks perfect for hip hop, drum ‘n bass and other electronic-influenced music. Next, this Chameleon Birch bop kit in beautiful black sparkle showcases a lot of the well-thought out upgrades and appointments Crush includes on every kit. 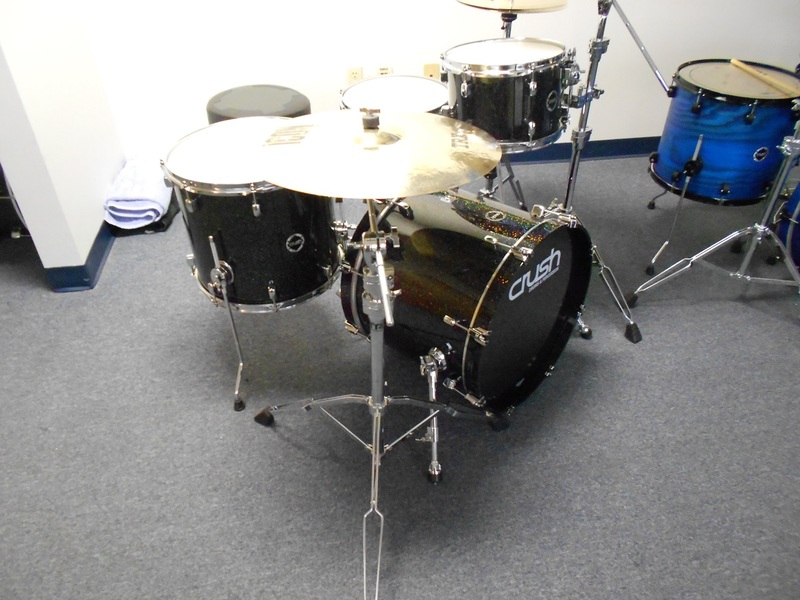 Check out the sleek black lugs, heavy duty hardware and Remo heads on that bad boy. You can even see the grosgrain ribbon used (instead of wire or plastic strips) to hold the snare strainer in place – crucial upgrade. Best part, this set has a MAP of only $399! Outrageous price for that kind of quality. Crush also had one of their new Sublime E3 Maple kits on display, but all of the pictures I took were absolutely awful (sorry). Learn a little more about the series on the company’s brand new website (launching Jan 24, 2013). Definitely worth checking out. Finally, check out this snare spread. You’ll notice a few of the company’s more popular models in the middle along with a couple of the super high-end M4 series. However, one in particular really stood out. And that quote kind of brings me to the most important thing I noticed about the Crush philosophy; if it works, do it. At the end of the day, these guys all love what they do because there’s a fair amount of mold-breaking going on here. They care about the product so much that they’re willing to take major risks on ideas and concepts that might be a little unconventional, but warrant further exploration because they just might make drummers happy. It’s not all about profit. 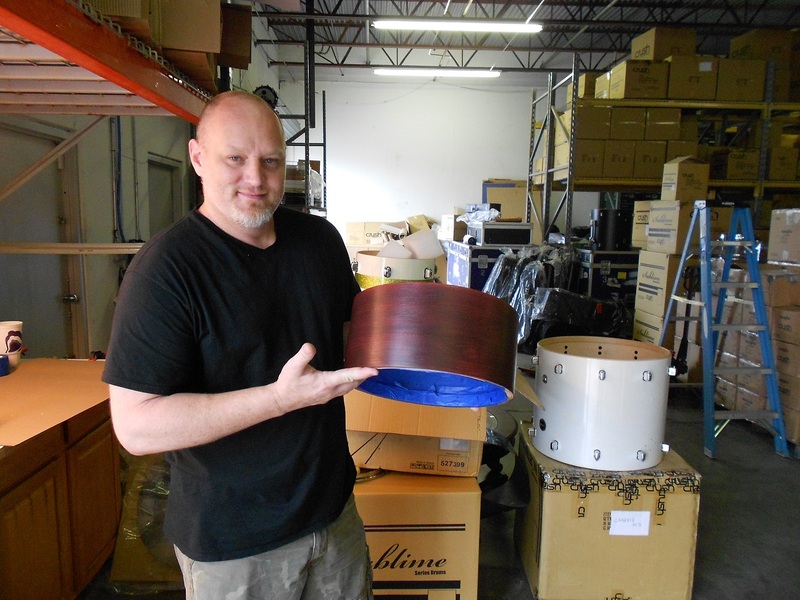 It’s all about creating a drum that offers everything a player could ask for at a reasonable and fair price. Over and over again, the Crush team proved themselves to be a group of ambitious, motivated guys who are just killing themselves to fulfill that vision. Pretty remarkable. With that, I wanted to close with this picture of Platt holding up a one-of-a-kind shell that he’d been experimenting with in the days before I arrived. Just to see what was possible with a shell like this he had already torched the exterior (yes, with fire) to see how the wood responded, and applied several coats of finish to make sure the grain really popped. That’s one of the founding CEOs doing all of that work by hand because it’s worth trying. 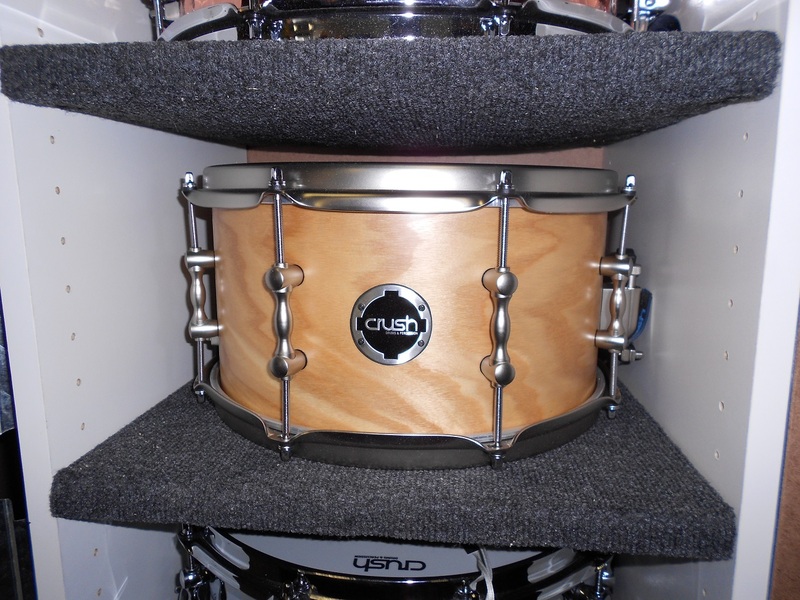 The result could end up being a few extra-special one-off snares, or it could be the beginnings of Crush’s first USA made line. Whatever works. Everything I hear about Crush is just better and better. My next kit will be one of theirs, definitely. Hey Sasha, I’m at the NAMM show in LA, and the guys from Crush are all here. Showed them your comment and they were really pleased! Let us know if you pick up a new Crush kit! Awesome! I wish I could go to NAMM, but it’s not a possibility at the moment. I’m in the hunt for a new kit at the moment and everything I’ve seen and heard has me looking for a CRUSH kit! Now it’s just a matter of deciding which one and finding my nearest CRUSH dealer down here in Sydney, Australia!!! 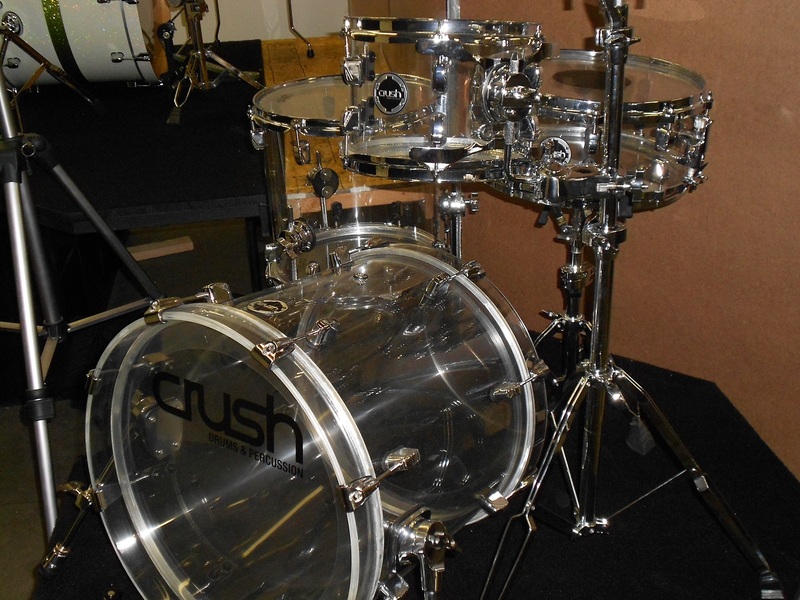 I’ve waited 30 years to see a drum set that gets me ready to play again, its the CRUSH acrylcs. Built with 22 kick 13 tom 16 floor and 14 snare. Sorry Crush I love SONOR hardware. The white chameleon birch kit showed up at a local shop at a great price. I nearly bought it, but for the 20×20 bass drum. Is there an affordable gig bag to fit a drum this size? I totally forgot to respond to this man! So sorry. 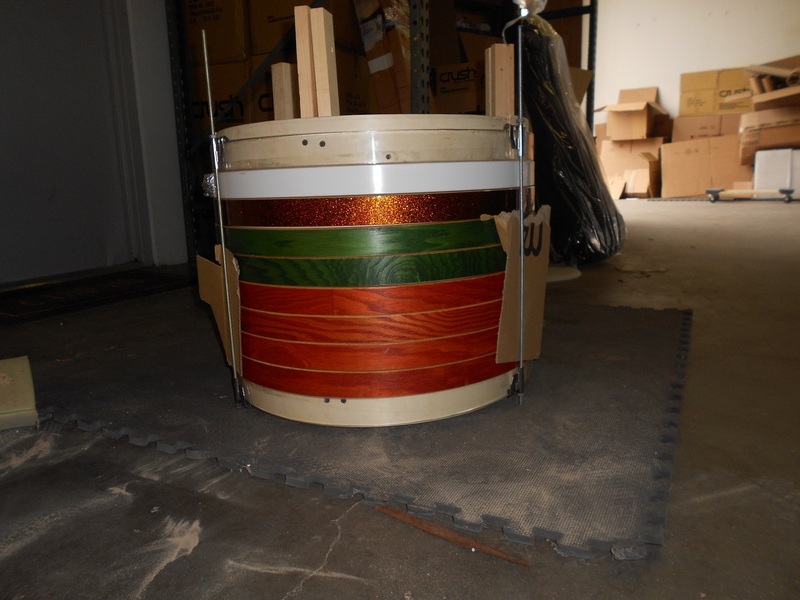 Are you still looking for a bag for the 20×20 bass drum? I can do some digging if so. Could no longer resist the great price and brought home the Crush white chameleon birch kit from the local music store. Great sound, value, and very well made for the price! I paid for two Crush T-shirts and almost six months have past and I have not received them, I keep emailing Jordan Hughes and he keeps telling me he will look into it, I don’t appretiate Crush stealing my money, I will never by anything crush again. Doug, did Crush ever reach out to you about this? I passed your comment along to their team. Let me know where you’re at. read my rant below…I hear ya! ware are your acrylic drums made.